My self-imposed job included sourcing and/or assembling many maps and lists. While some of these are easily found on the web (countries of the world, or US or Australian states), others required some editing or curating to be studied more efficiently (major rivers of each continent, and similar for the seas, bays, straits, islands, waterfalls). For instance, the Seven Seas of yore differed depending on where you were in the world, and often included more than seven. Occasionally we found it was better for Laura to take her own notes—this can help one absorb the information better. Blank maps were useful for repeated practise over the weeks. On more than one occasion Laura would come to breakfast to find a blank map of South America, or the US, or Africa sitting there, ready to fill in countries and capitals. I’d assemble huge lists of a variety of things, be it the major folks associated with each US president (wife, VP, chief justice, speaker of the House), or each large North American city’s major league sports teams (subsidiary list: mascots. Yes, it’s been a question on the show). How many protectorates does the US have, anyway (or did you mean Associated States, unincorporated territories, incorporated territories or Commonwealths)? The details can get pretty fine, akin to hair-splitting, especially since every detail leads to another DETAIL. To whit: “Guam (US territory), along with the Northern Mariana Islands (US Commonwealth) make up the Mariana Islands, by the famous Marianas trench, including the famed Challenger Deep where four expeditions have dived (the latest being James Cameron getting to the floor), speaking of whom…” Pretty soon, if you’re not careful, you are wandering in Bob Harris’s Trebekistan, the mythical place where every fact connects to every other, and you lose the concept of up and down and night and day—mybe even self. Laura was very good—well, as much as you can be—at staying focused, not delving too deep into any one area of study, but of course from time to time we’d get going on some topic or other that was too fascinating not to know more about. But each time she’d stress that she’d stolen precious time from general knowledge studying. Fun Fact I learned studying for Jeopardy! The ruler of the Principality of Andorra, 6th smallest nation in Europe, nestled in the Pyrennees between France and Spain, is a monarchy, ruled over by co-Princes: the Bishop of Urgell (whose diocese encompasses that part of Spain) and the President of France! In the end, was my help welcome? I think so. And the quizzes left out on the table, the “recite the Presidents” challenges in front of visitors or “what’s the capital of Missouri?” as we did the dishes? Generally, yes. Did she get grumpy about it sometimes? Of course. [“YES! !” —Laura]. But my job was ideally to help her to be as sharp as possible on as many topics as we could think of, without us somehow turning into a cerebral version of Cato (who had a similar—if physical and incredibly slapstick—job to keep Inspector Clouseau on his toes). Laura knew it was my role too, and despite the occasional grumbles, she knew that this month was her best chance to fill in as many voids as she could. And there’d always be voids. Not being American is a definite handicap, and although Laura had her Presidents, states and capitals pretty well locked down, how far should she go? Cabinet departments? The current or previous Presidential Cabinet members? National Parks? 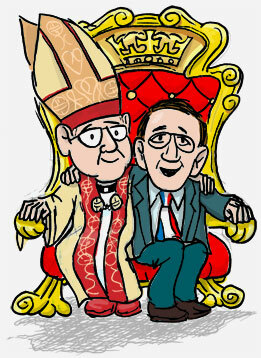 Supreme Court Justices? Bill of Rights? Constitutional Amendments? (All of the aforementioned have been categories from time to time.) Even as she undertook her studies, we had to decide what studies to give weight to. Already we were gauging the likelihood of certain categories (for example, mixed drinks or champagne since the episode was going to air on New Year’s Day). Six times a week, practical rehearsal time always started at 7:30 pm sharp, when Jeopardy! is aired in Toronto. Regrettably, for most of late summer the show is in repeats (mainly some of the tournaments—teachers, kids, celebrities, etc. of the past year), but that had to suffice. We practised reaction time (after waiting for Alex to complete the question, of course), repeated clicking of the button, the continual standing for the entire time—any element of the studio game we could attempt to simulate that would give her some measure of familiarity for the big day. Because, let’s face it, in a studio, with the lights and the makeup and the audience, it would be a blur. As it was, once she was practising as if it was for real, the game’s rapid-fire routine was clearly apparent. Suddenly, there’s no time to think. It’s one thing to have it in your head, or be thinking down the right lines; you have to be able to spit it out correctly in 5 seconds. I scored each game with the Coryat scoring system, which assumes wrong answers don’t cost you money. Since you’re not playing against anyone, this system is measuring how many questions you know per game period, excluding both financial penalties—though I kept track of wrong answers for later analysis—and other people getting the question first. It functions as an absolute score of your knowledge each game. It’s a bit ruthless, but it helped us see where omissions or errors were occurring, and allowed us to spot categories Laura hadn’t yet focused on. I would chart Laura’s progress on a spreadsheet to see how she was progressing. As she focused and studied, she rapidly improved in geography, and various US categories, like Presidents, states, capitals and history—the sorts of things that came up often. She also started reducing her guesses. Guesses pay off less often than you think (human nature being quick to note successes but not misses). They’re especially dangerous in the higher questions of the Double Jeopardy round, where an “I’m-pretty-sure” can cost you $1600 or $2000 in a blink. In the end, the daily rehearsing made for steady improvement. Laura had a solid breadth of knowledge, and was able to hold her own, even “running” the occasional categories (ie answer all the questions in a clean sweep). But I also noticed something over which Laura had no control: once in a while a game came that was stacked against her. Sometimes none of the TV contestants in those games did well, either. The majority of these types of games featured categories that deviated from the standard playbook—topics like “NO.1 IN THE NFL DRAFT” or “MY SO-CAL. LIFE” (to cite two real examples). When a game had more than one or two of those, or worse, three or four, Laura would have to hope that no one else had an especially strong suit in those topics either. On the other hand, generally any of the sciences were rarely mastered by contestants, and Laura would be a lock on many of those—but equally likely could be top 40 hits of the 1990s, or specialty cable channels, and that was not something she had a single inkling about. So what kind of game would it turn out to be? I couldn’t wait to find out either, and I still don’t know. I’m just as much in suspense as all of you. Victoria Falls (aka Mosi-oa-Tunya, located between Livingstone, Zambia and Victoria Falls, Zimbabwe) on the Zambezi is the largest waterfall in Africa, largest sheet of falling water (but neither the widest nor the tallest waterfall) in the world. 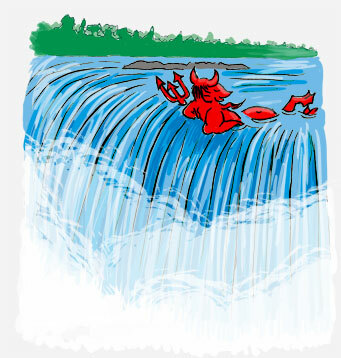 When the water’s at the right level, a rock ledge near the edge creates an eddy called “The Devil’s Pool” where people can frolic and look over the edge. Wait, you don’t believe me, do you? Here’s photos. Here’s a video. But be careful. I’m loving all these details!! You sneaks – keeping this such a secret! Extreme trivia: A couple of decades ago, the brother of a friend of my family, a UWO professor, was the Bishop of Urgell. Okay, he got the hard part out of the way, now we need to get him to the Zambezi! Anything to be a potential Jeopardy! question! @Luisa: Re: Sneaks. Well, as Laura said in the second post, she had a lot of legal papers to sign during the New York audition, and even more in L.A. (she’ll describe that in due course). The jist is, she CAN’T reveal the outcome, and was instructed to keep it quiet until time to promote her appearance. Further (as she’s mentioned already) any potential prize money will not be issued until 4 months after air date (and that will be subject to various level of US taxes). And add in one more factor: like most folks’ wedding day, the Jeopardy taping was somewhat of a blur to her. She’s told me that she remembers only fragments, but is sure that the rest will flood back as she watches it. That said, we did have two or three secret-keepers—the primary one being my mom—and they did their job far better than Peter Pettigrew. Though only a couple knew about the taping prior to it occurring. Need to know basis, as they say.